Don’t you just love Christmas? Adverts to warm your heart. That time of year again when the big stores share their messages for Christmas. Sometimes it is just nice to be reminded that the true meaning of Christmas is about love, family, friendship and caring. Paddington Bear is a winner every time. M & S and their warm and funny Christmas advert. A popular trend in picture books is to add a bonus CD. They offer more than just a picture book to read. Pre-schools and primary schools love them. They are great for listening along in the classroom or in the car on the way to the grocery store. Children with English as a second language use them to read and listen to the rhythm of English language. They are certainly popular in my school library. Peter Millet’s latest book is no exception. A familiar tune, well supported by the wonderful illustrations by Deborah Hinde. Her illustrations are bright and colourful but have a softness to them which just makes the kiwis so cute and very appealing. Their eyes, in particular are so warm and friendly, appealing to the reader to join them on their journey. Check out their attempts at bungee jumping! Adventurous yet gentle but lots of fun. Love the little fantail flitting between the pages. Great gift for Christmas or for end of year teacher present. It is also great to have the song in Te Reo as well with easy to follow lyrics. Michael is on a mission. It is one he is unprepared for and actually doesn’t want, especially as the mission is to save his sworn enemy, Angus, from being kidnapped. In his attempt to avert the kidnapping, Michael and his best friend Elvis follow whatever leads they can find. Some of the leads get them in to trouble and involve breaking a few laws. 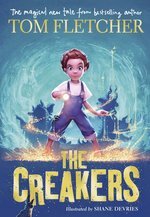 While not exactly wanting to end up as criminals, they do have to decide how far they will go in order to keep Angus safe from the kidnappers. They do of course have to work out who the kidnappers are and that could be almost anyone. This is a great read with lots of action, a little bit of revenge that doesn’t quite happen the way Michael wants it to happen, humour and most importantly, likable and believable characters. Michael is not perfect, but he is genuine and a good friend to have. Despite some initial bullying and a definite dislike of Angus, Michael realizes that sometimes the best thing to do is the right thing. A good read for ages 8 plus. Thoroughly enjoyed the journey and meeting Michael and his friends. Michael and Elvis have had other adventures in Suzanne’s previous novel How I alienated my Grandma. I confess it is a book I haven’t read yet but after enjoying this novel, I will definitely be looking to read their other adventures. 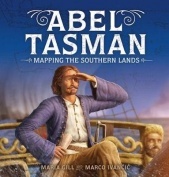 Selection of new New Zealand picture books with bonus CD’s. Playful, funny, great to sing along to. Great Christmas gifts too. The following picture books are new from Scholastic New Zealand and just out in time for Christmas. 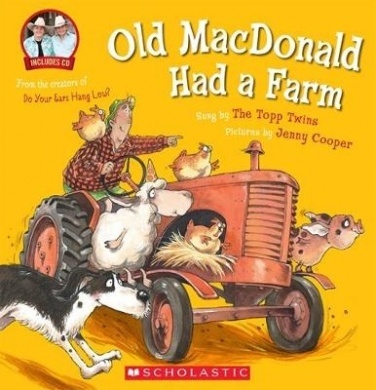 The song Old MacDonald had a farm is a classic that people all over the globe have been singing for years. This new picture book version is illustrated by the very talented Jenny Cooper. Her illustrations as always, are delightful. Her animals are cute, funny, and just so lovable. I love Jenny’s very kiwi farmer wearing his iconic red checkered flannel shirt. The bonus CD is sung by the Topp Twins. They sing with heaps of energy and I bet you won’t be able to resist turning the CD player up loud and singing along. A delightful picture book for younger readers that will have you smiling and singing all the way through. As we come to the end of the year, this book and CD along with the others listed below, would make good gifts for Christmas. 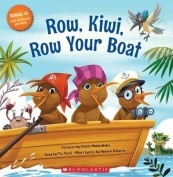 We can sing or read along with this playful picture book as three young kiwi spend the day hunting for a taniwha. They are so busy looking for a taniwha that they don’t notice something lurking in the waters behind them. Along the way they make friends with a diving duck, a slippery eel, a leaping lizard and many more birds and animals. The big question though, is just who is following them? 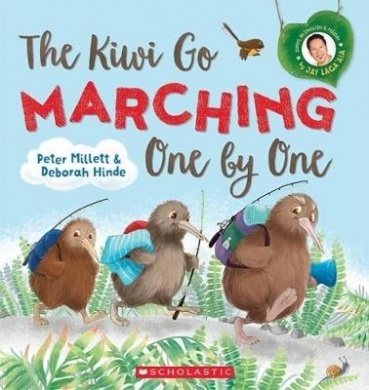 The very familiar tune, the bright and sweet but very Kiwi pictures makes this book lots of fun and a special one to send to family overseas. Whose eyes are those in the garden? Look, it’s a scaredy-sprout! What do you think scared that sprout so much? A-A-A-A-R-R-R-R! 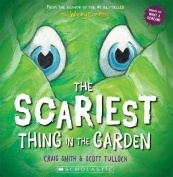 Laugh out loud to this super-silly song and discover what truly IS the SCARIEST thing in the garden! There is quite possibly hardly any family homes in New Zealand that don’t have a copy of Craig Smith’s Wonky Donkey. The success of Wonky Donkey led to more of his songs being made in to books with The scariest thing in the garden being his latest. Like his other books humour is key. Bright bold illustrations ensure readers keep turning the page until the last surprise. The bonus CD ensure readers also keep singing along. Stan was a rare dinosaur, a one of a kind. Most from their front, HIS roar came from his BEHIND! 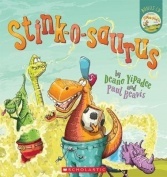 Youll split your pants laughing at Stan, the worlds only STINK-O-SAURUS. But can his stinky antics save the day and keep Tommy T-Rex far away? Author Deano Yipadee and illustrator Paul Beavis have worked together on picture books before and their collaboration continues to be one of success. They obviously share a wicked, boyish sense of humour which comes out both in the story and illustrations. 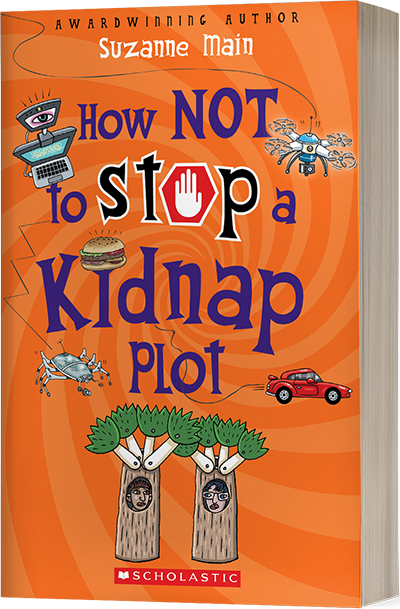 This is another book which is sure to please young readers. Bright, cheeky illustrations of a stomping dinosaur with a roaring behind and lyrics to sing along to make this another one that will make children laugh out loud. This book arrived on my desk for our library and I have nabbed it before the children as I want to read it first. The cover is gorgeous, and I know I use that word a lot, but it is gorgeous. When are immediately drawn to the book with its wonderful colours, embossed title, and Lucy, our main character appealing to us to join her in a magical adventure. There are some very cool illustrations throughout the story adding to the wonder of it all. The print size is an ideal size, just like Goldilocks and her chairs, not too big, not too small, but just right for readers who sadly, are often put off reading because of the size of the print in some books. I can’t wait to start reading. What silently waits in the shadows at night? What’s under your bed, keeping just out of sight? Do you ever hear strange, creaking noises at night? Ever wonder what makes those noises? Lucy Dungston always did. Until, one morning, Lucy discovers that all the grown-ups have disappeared – as if into thin air. Chaos descends as the children in Lucy’s town run riot. It’s mayhem. It’s madness. To most kids, it’s amazing! But Lucy wants to find out the truth. Lucy lost her dad not long ago, and she’s determined not to lose her mum too. She’s going to get her back – and nothing is going to stop her . . . except maybe the Creakers. Not only do we have an exciting premise to get us hooked but there is also a very cool book trailer to watch as well.